Screaming Power is happy to announce that it has signed a partnership agreement with Lakefront Utilities to provide a new iPhone and Android app for Lakefront’s electricity and water customers. Lakefront’s App will be available for download on The App Store and The Google Play Store in the coming weeks and will be the utility’s first step in providing information and communications through mobile devices. 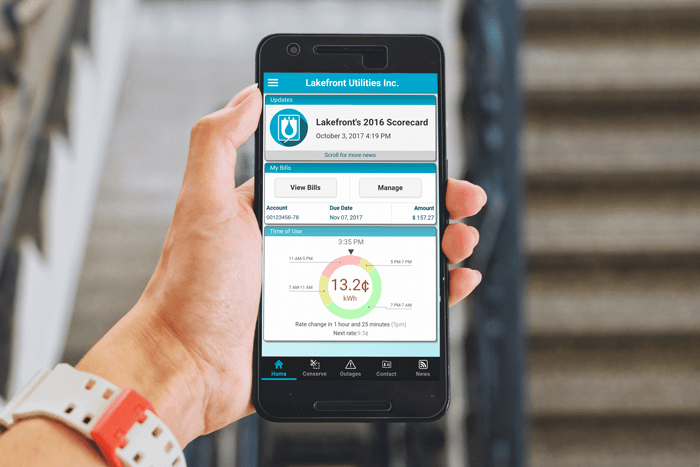 This innovative Utility solution allows Lakefront to communicate and help the customer better interact with the Utility and their energy data on the go. The mobile solution will provide news, updates, water and electric usage, conservation programs, outage notifications and billing information to the customer. With continued exposure to the App user, the parties will look for more ways to deliver value while innovating to provide an ever-improving customer interaction. This solution is part of Screaming Power’s commitment to better link the Utility and energy users with the Internet of Things (IoTs). With partnerships like Lakefront, Screaming Power looks to provide Utilities, both small and large, an opportunity to cost-effectively leverage mobile technology. This application has been possible through the assistance of Screaming Power, the Federal Economic Development Agency for Southern Ontario (FedDev Ontario), Northumberland’s Collaborative Economic Development Projects (CEDP), the Ontario Centres of Excellence and the Utility Cooperative The CHEC Association. Screaming Power is revolutionizing customer engagement by providing a mobile platform that connects the energy user, allowing for effective and secure two-way communications to educate, change behaviour and encourage sustainability. Our extensible Intellectual Property provides a low-cost, digital infrastructure with a self-sustaining Eco-System. Our Scream Utility & Scream Enterprise mobile solution focuses on reducing ‘cost-to-service’ for while driving user satisfaction and innovation. About Lakefront Utilities Services Inc.
Lakefront Utility Services Inc. (LUSI) provides the human resources, administrative, financial and operational services to The Town of Cobourg Holdings Inc. and the utility subsidiaries, safely and efficiently, in compliance with applicable regulations. LUSI provides customer-focused and cost-effective multi-utility services so that customers benefit from service advantages and economies of scope cost savings. LUSI also operates the Water Systems for the Town of Cobourg, Township of Cramahe (Colborne) and the Hamlet of Grafton.